Detailed Information regarding Kangaskhan’s Location and the strategy to encounter it in Pokémon Sun and Moon. Kangaskhan’s spawn rate at the Grass Patches in Vera Volcano Park is very low. Attempting to encoutner it this way is tedious since it requires luck and endurance. Fortunately, Cubone also spawns at the Grass Patches at a higher rate, and it can summon Kangaskhan. Therefore, be sure to catch one when it intrudes a SOS battle instead. I found one and was like cool I’ll get it for my pokedex and move on. Accidentally killed it with prima then was like I’ll look for it again. Just now found out how rare it was uuuugghh. I️ found a male Kangaskan and now it will never left my team! I was shiny hunting cubine and a kangaskan showed up and I wasn’t even aware that I could get one this way! And when I look it up it’s super rare so I’m pretty happy! 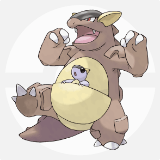 I nearly dropped my ds when i walked into the first grass patch and the first thing I ran into, WAS a Kangaskhan! I just encountered one while looking for a fletchling. thx this was very helpful ???? I caught one and I was looking up if they were all female because they carry one in their pouch and it said that it was rare to find one. I think I’m lucky now because I was looking for a cub one and found something rarer. ???????? Hahaha! I was reading this and a cubone sos chained one! Thanks for the help anyways ???? To be honest I would rather look in da tall grass then wait for a cub one to summon it its to me more frustrating and it’s like a snorelax only a snorelax to get one you need to wait for a munch lax to summon one or u evolve the munchlax. How long did it take you to fingers him from this strat?